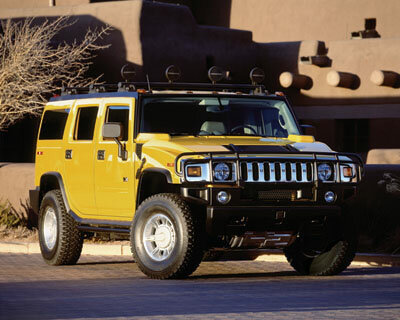 With its rugged good looks and incredible off-road capabilities, the Hummer H2 and H2 SUT have brought a whole new level of capability and flexibility to the marketplace. The H2 and H2 SUT have short overhangs for radical approach and departure angles and exceptional ground clearance for minimal impact on trails. The 17-inch wheels, heavy-duty independent front suspension and five-link rear suspension provide superior handling, carrying and towing capability. H2's power is derived from the standard 6.0-liter V8 that generates 316 horsepower at 5200 rpm and 360 lb.-ft. of torque at 3600 rpm. The engine is mated to a heavy-duty four-speed automatic overdrive transmission. H2 also features a standard, powertrain-integrated Borg-Warner two-speed electrically controlled full-time 4WD system. A Bosch four-channel anti-lock braking/traction control system (ABS/TCS) provides optimum control on slippery surfaces. ABS can detect and adjust its braking capabilities to rough off-road surfaces like gravel and potholes. TCS also includes the ability to gain traction through a single wheel, if necessary, and more wheel slip in the traction control mode for sand and desert racing conditions.